Snoogg Ultrasonic Pest Repeller Offers You A Permanent Cure of Pests Disturbance! Pests Are More Than Just An Annoyance! Having mice, rats, or other pests invade your home or business is a serious problem. Pests carry disease and destroy property! Mice chewing on wires even can be a fire hazard! However, getting rid of mice and pests can be a real challenge. Humane traps, glue traps, spring-loaded traps, and poison are a hassle, and they can be dangerous to adults, children, pets, and wildlife. You have to get hands-on with mice, whether relocating living mice or disposing of dead ones. NOTE: These solutions are all temporary solution, not a permanent cure. Luckily, Snoogg ultrasonic pest repellent drives away pests for good! One device consumes 5W/days and works 24/7 years after years to drive away the pests. The Snoogg ultrasonic mice repeller can effective against mouse, rats, spiders, ants, bug, fleas, roaches and even bedbugs! The Snoogg electronic pest repeller has adopted the latest ultrasonic and electromagnetic technology to enhance the strength of ultrasound and electromagnetic wave! Auto-varying ultrasound between 22-65 KHz makes the pests never become immune to the sound. Electromagnetic waves allow for better penetration through walls and obstacles. 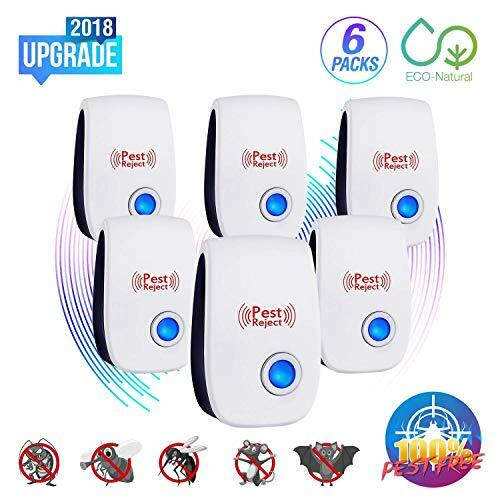 6 Packs of ultrasonic pest repeller can cover a large area up to 7200sq.ft. Easy to use! Just plug in. ⚡2018 Upgraded Smart Chip: The ultrasonic pest repeller keeps on emitting more powerful and non-repetitive ultrasound between 22-65 KHz to attack the auditory and nervous systems of pests, which makes the pests never become immune to the sound. Work well on mouse, cockroach, spider, bedbug, mosquitoes, insect, rat, rodent, flies, ant, fleas and more pests. ⚡No Chemicals, Poisons or Traps: Ultrasonic mouse repellers work by producing tones which are inaudible to the human ear, but unbearable to mice and rats. You no longer have to worry about a child putting their hand in a trap or touching any poison. Ultrasonic mouse repellers won't hurt you, your dog, cat, or most other household pets. ⚡EASY AND CONVENIENT TO USE: Simply plug the mice repellent into the electrical outlet, then the electronic pest repellent will start to drive pests out for good. Please install the pest repeller near the areas where the rat or pests might visit. 10-30 inches above from the ground is recommended for crawling pest, while higher for flying pest. ⚡LARGE COVERAGE AREA &LONG LIFE : Snoogg pest reject is effective for an area up to 800~1200 Square Feet. Though the pest repeller works very well, but we recommend placing those sonic repellent in every room! Further, one rodent repellent can last for a couple of years, saving you hundreds of dollars in paying for exterminating pest control service. ⚡60-DAYS MONEY BACK GUARANTEE: Generally the product takes 4 weeks or so to see result depending on the severity of pest. To free you from anxiety about the pest repeller, we offer service for full refund within 60 days. If you have any questions about this product by Snoogg, contact us by completing and submitting the form below. If you are looking for a specif part number, please include it with your message.